Swain was always a thematically complex champion, but the various aspects of his character didn’t really make sense together. He was a renowned military strategist in Noxus, but on the Rift, his “strategy” generally involved walking towards enemies until they died (or he ran out of mana). And then there were the ravens. Beatrice and Swain were always together, and Swain could transform into a bird, but how did any of that connect with his role as a military tactician? There was a lot to sort through before Swain could step up as the ruthless leader of Noxus, and Swain’s lead developers are here to share what that process was like. 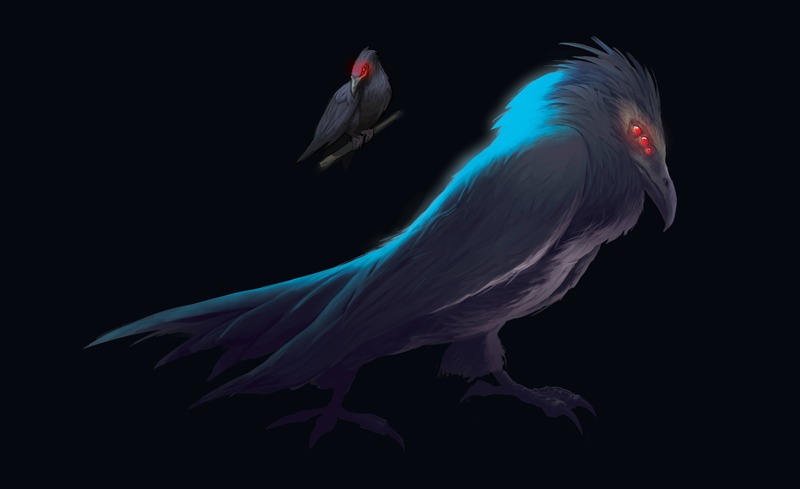 What elements of Swain’s original character did you want to maintain during the update? Here’s a potentially controversial (but revealing) statement: This is one of the first champion updates I’ve worked on where I don’t think the original character was actually the biggest touchstone for us. It felt more important to make the Swain in players’ imaginations real. Perhaps more than with any other character, the idea of who Swain was shifted with developments in League’s lore. He went from a creepy battle prodigy who somehow never lost (but only talked to his bird), to a brilliant man ruling the most ruthless, deadly nation in Runeterra. With Noxus becoming more defined, I’d look at Swain and wonder, “I thought he was a general, why’s he wearing green bathrobes? Why’s he transforming into a birdman? How does that help him win battles?” There were definitely answers to those questions in the old lore, but the weirdness would’ve only grown over time if we hadn’t tried to find a new center and start from what people thought Swain was, rather than what he actually was. The pitch that started it all. How’d you approach updating Swain’s backstory and character? 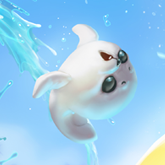 I think the most resonant characters in League are the ones that draw on familiar archetypes but change them in ways that give players something new to discover. For Swain, we decided that the core archetype would be “ruthless dictator,” so developing his backstory was a quest to find the ways we’d twist that into something unexpected. 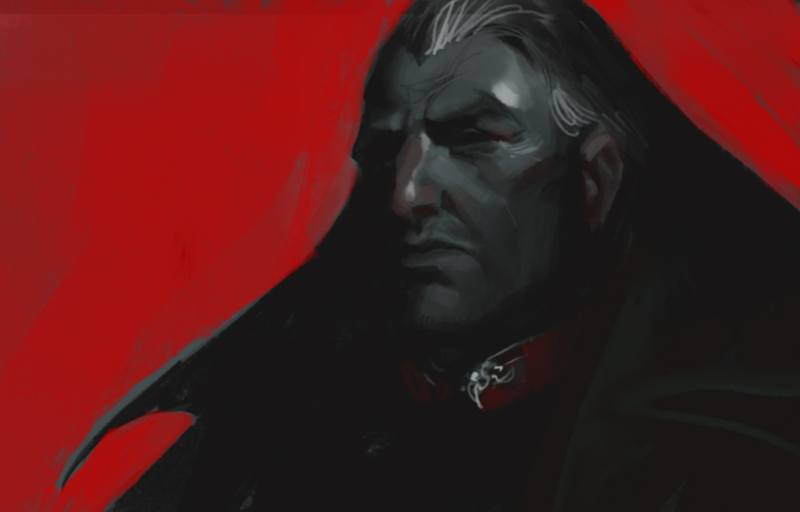 Swain is a dictator who’s able to enforce his will because he’s made a Faustian bargain… but it’s inverted. The demon he made a deal with was outsmarted (as far as we know). And Swain is such a ruthless ruler because he’s able to channel the demon’s power and see farther than anyone else—Swain plays the long game and is the “visionary” of Noxus. This focus also enabled us to bring back shades of the old “master strategist” archetype, but in a much more specific way. 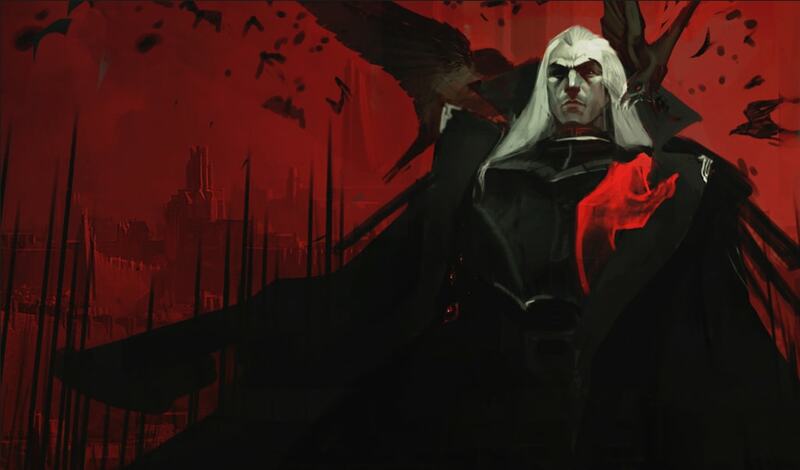 Having conquered a demon of secrets, Swain can send extensions of his will in the form of ravens across Runeterra, gathering memories from the dead. Some of these whispers haunt him, giving him glimpses of a dark future. This makes Swain a great strategist, but it’s not just because his wisdom stat is higher. Swain’s at his most brilliant when he’s at his most brutal. The other important part about updating Swain was parsing out his psychology. A lot of Noxians are driven by what they believe about strength, and that belief should be different for each character. (Otherwise, they’d all have the exact same thing to say, and there would never be conflict.) Swain believes in a vision of strength through unity, even if he must play the villain. What was the most challenging part about updating Swain? Usually when we do VGUs, the characters get a bit more streamlined in terms of their themes. 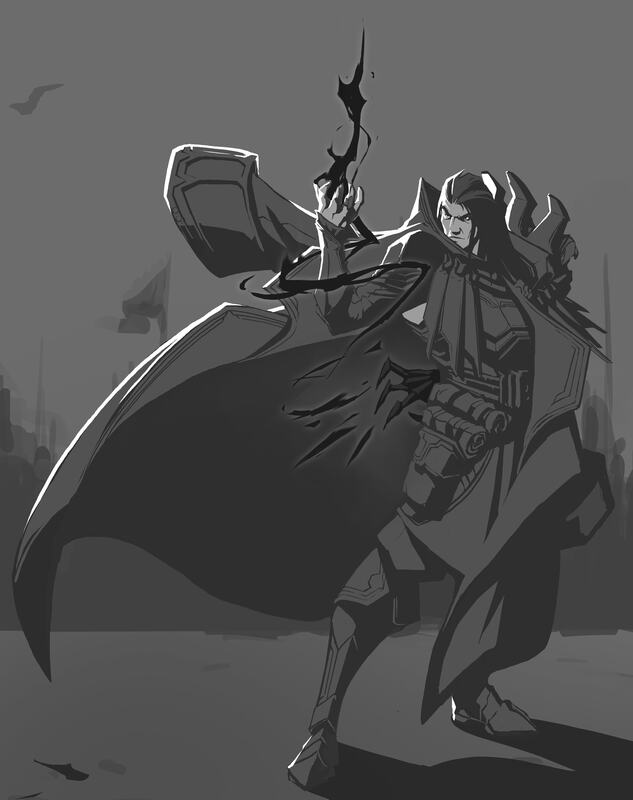 For Swain, we initially sacrificed the demonic bargain and raven aspects of the character, since we identified “ruthless dictator who wields magic” as his key component. But the first iteration didn’t really feel like Swain and we couldn’t figure out why. Some people would tell us it wasn’t Swain because he wasn’t “Noxian leader” enough. And others would say it could never be Swain without the limp. Or ravens. Or not just ravens, but Beatrice. So it became kind of a constant balancing act. Keeping all of the themes in play, but identifying which ones to emphasize where. Conversations within the team were super difficult because everyone had their own balance in their head, and then the balances would get reshuffled as team members changed and as we talked to other teams. But the more we built, the more Swain started to come into his own, and you could judge new elements against the existing ones. It wasn’t until the final few weeks that a lot of the work in progress proved out. How did Swain’s new role as the Grand General of Noxus impact his visual design? We wanted to keep Swain’s design simple, especially his clothing. Noxus values strength above all, so functionality is more important than appearance. Swain may be the Grand General of Noxus, but he couldn’t care less about what others think of him. He’s wearing practical armor, similar to what he would’ve worn when he was a soldier, and his captain’s coat is the only thing denoting his status. We talked about adding more ornate details to his coat, but Swain just doesn’t have the desire for dramatic flair like some other Runeterran leaders (lookin’ at you, Azir). 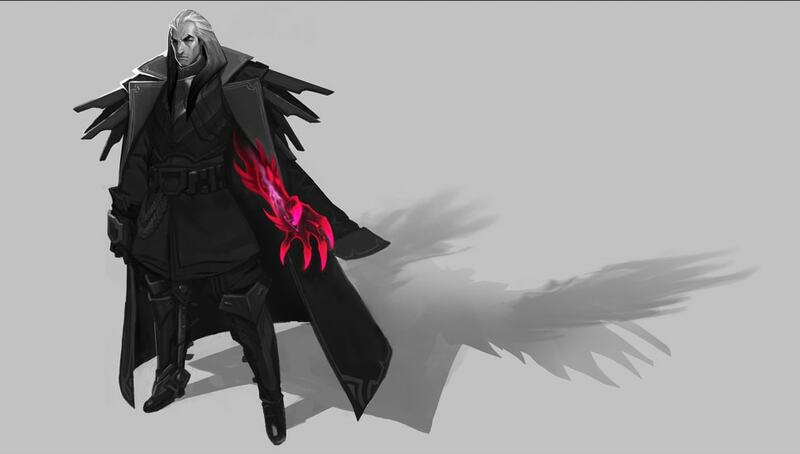 We envisioned Swain as more of a Darth Vader character, in the sense that he has a bold, simple design and color scheme. Swain becoming the Grand General of Noxus also gave rise to some tough questions, including “How old should Swain be?” Some people thought one of Swain’s defining characteristics was that he was League’s old dude, but Swain’s old age no longer fit his character very well. 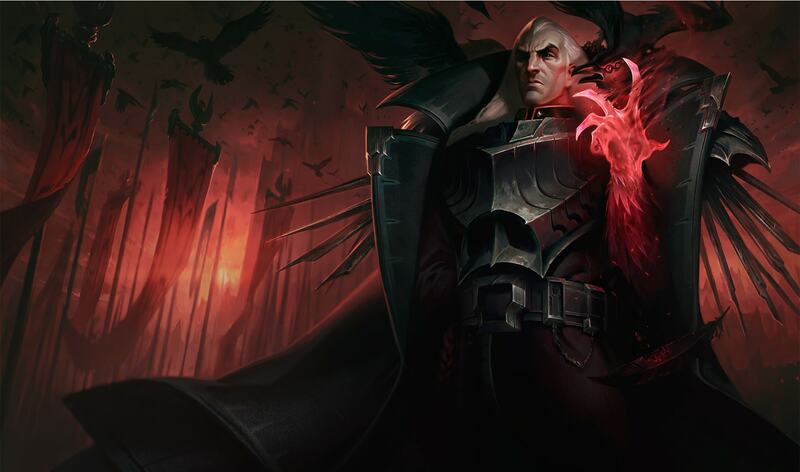 Swain is the person on the frontlines leading Noxian troops into battle, inspiring and preparing the soldiers for war. It didn’t make much sense for the one leading the charge to be an elderly guy—it needed to be someone lively and strong. But Swain also couldn’t be some young whippersnapper because people wouldn’t respect him. This is why Swain’s a seasoned military man. He’s experienced, both in life and in battle, and this earns him the respect of his people. And even though he’s a bit past his prime, he’s still ridiculously powerful because of the demon he’s captured. We did a lot of portrait studies to try and hit the sweet spot where Swain looks mature and wise yet also strong and capable. He needed to command respect and have presence. We also decided to remove Swain’s limp and cane for similar reasons (it’s hard to fight on the frontlines while also relying on a cane). However, some people believed the most aspirational part of Swain’s character was that he’s crippled and yet more powerful than he appears, so we tried to find a middle ground. In Swain’s updated backstory, he lost an arm and had an injured leg, but when he made a deal with a demon, his body was restored. What others perceived as a weakness was transformed into strength, but now his hand serves as a constant reminder of the choice he made. This is a classic example of Swain turning a handicap into an advantage. Swain doesn’t accept setbacks. Also, Swain wears a leg brace—which is a nod to his old design—and word on the battlefield is that he rather enjoys dancing with a cane. What was it like illustrating Swain’s splash art? Throughout production, Swain’s visual design was about this stark statement of black and white plus red, so I tried to see if I could incorporate that into the thumbnails for his splash. It felt like a propaganda poster, which some people thought might be more appropriate for a promotional piece than a splash. I wasn’t able to fully convince the team to try it, so we compromised. The palette was challenging to work with since reds have to remain fully saturated (otherwise they start to look pink) and blacks can look dull or generally overwhelm the composition. It was a difficult piece to balance, and I’m not sure if I pulled it off. We put a lot of thought into the gesture for Swain's demon hand—we wanted him to feel relaxed but in control, with an air of brooding effortlessness. What about Swain’s original kit did you want to maintain? Swain’s ability to wade into teamfights as a frontline mage. Swain’s snare. It’s so core to his character. The lifestealing and healing mechanic. Nothing else was guaranteed, including his transformation. This was mostly because during early design work, we struggled to find a version that felt like a huge transformation moment—something that was exciting and satisfying to use—while also feeling fair to play against. We kept landing on iterations that either felt lackluster, meaning they didn’t really stand out from game to game (like Swain’s old ulti), or else Swain would gain crazy amounts of power with little counterplay. What was the development process like for adding in the transformation? Despite the early struggles, we still wanted to include some form of transformation in Swain’s kit. 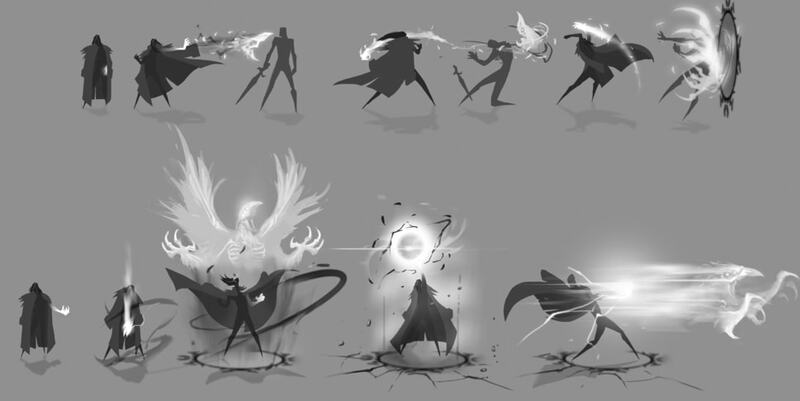 Up until about two months before his PBE debut, Swain’s transformation ability was on his “E” and worked similarly to his old ultimate, where he’d drain HP from nearby enemies. In this version, Swain couldn’t cast any spells but he’d gain extra movement speed. Swain collected souls from champions who died around him, and he could spend five souls to cast an empowered version of the transformation, which was basically the same ability but stronger. We moved away from this design for multiple reasons. For one, requiring a maximum number of souls to cast the more powerful transformation created feast-or-famine situations that didn’t feel good for Swain or his opponents. There were also thematic concerns: Swain is supposed to be in control of the demon, yet he’d completely silence himself in demon form. It didn’t seem like Swain was empowered by the transformation, and it was selling the fantasy short. To try and resolve these problems, we moved the transformation ability to Swain’s ultimate and gated it behind a longer cooldown. Increasing the cooldown meant we could add a lot more power into the ability. Now, Swain no longer needs a certain number of souls to transform. Instead he has access to a more powerful ability while in his ultimate form, and the damage it deals increases based on how many souls Swain has to “spend.” He’s also able to cast his other abilities while in demon form. Together, these changes helped create a more memorable ult for players that also better fit Swain’s thematic. Exploring ideas for the demon whose power Swain captures and unleashes; this influenced the appearance of his demon form in-game. It’s true—there was a time during development where Swain didn’t have any ravens. Beatrice and her feathered friends disappeared completely when we were trying to simplify Swain’s many themes. (Plus we wanted to clarify that Swain himself was the source of his power, and not the birds.) But homing in on only the “ruthless dictator” and “dark mage” elements of his character didn’t seem right. It just didn’t feel like Swain. We eventually realized we were gonna need the birds. When Swain was focused around being a death mage, he didn’t have any bird-like elements in his ultimate form. 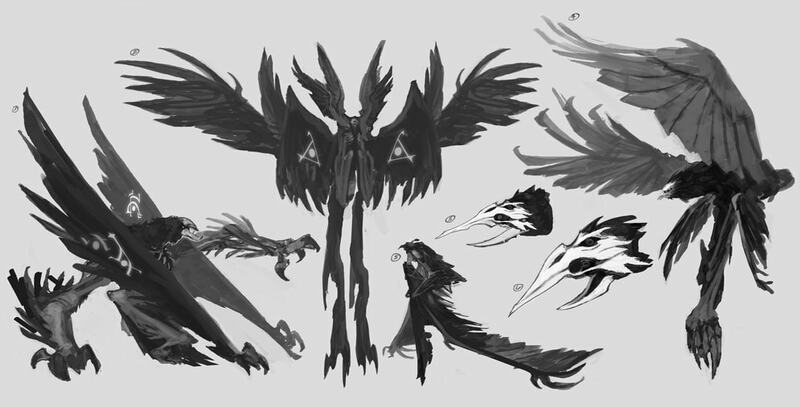 That’s when we asked ourselves, “What if we at least gave him wings, like an Angel of Death?” Once we put the “bird form” in-game (aka the wings), it felt so much more like Swain. And then when we added the ominous hover, everything finally started coming together. We added the iron feathers on his coat, which connected him to the raven theme in a less literal way while also hinting at the wings that appear in demon form. And at this point, Swain’s gameplay was already solid without ravens doing the brunt of his dirty work, but we saw an opportunity to do something immersive and new to League. Let’s just say we didn’t murder Beatrice… we made Beatrice a murder. Bananaband1t is a writer and editor on Nexus. She used to secure kills with Ebb & Flow, but now she’s a hardstuck plat ADC player.